No matter how hard we try to escape it, our past is with us. We may succeed in fooling ourselves and others for a certain length of time, but the past has a way of sneaking up on us and tapping on our shoulder. As William Faulkner wrote, “The past isn’t dead. It’s not even past.” The same axiom holds true for family and place, the two inescapable, powerful sources that shape us inexorably. 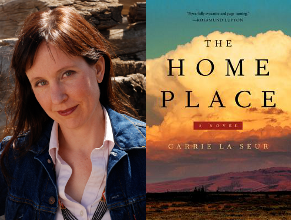 In Carrie La Seur’s masterful debut novel, The Home Place, her protagonist, Alma Terrebonne, has done everything possible to leave her dysfunctional family and its tragic history behind in Montana. She escaped by earning a scholarship to Bryn Mawr College, a small women’s school outside Philadelphia. Having distinguished herself there, she then attended Yale Law School. Now, fifteen years after the winter car accident that killed her parents and took her younger sister Vicky’s leg, Alma is a hard-charging workaholic corporate attorney in Seattle living the sophisticated urban life. She is content, or has at least persuaded herself that is the case. But a phone call from Billings changes everything. Vicky has been found dead of exposure in one of the city’s drug-infested neighborhoods, and Alma is called home to help arrange for the funeral. While Alma and Vicky had remained in contact, their relationship was fraught with drama. Vicky began a downward spiral after the car accident, despite adapting fairly well to her prosthetic leg. Although she had been taken in by older brother Walt and his wife Helen, by her early 20’s she was a mother to Brittany and was using drugs, bouncing from one job to another, and relying on number two brother Pete and her sympathetic grandparents to help her with finances and child care. Alma returns home warily but with the sense of obligation and honor that has always served her well. Once back in Billings, she learns the details of Vicky’s death, which generally appears accidental but which has also raised a few red flags for Detective Ray Curtis, a Crow Indian whom Alma knew in high school. With her lawyerly mind now fully engaged by a complex problem, Alma works with Curtis to dig out the truth of Vicky’s death from under its mysterious circumstances. They are both suspicious of some of Vicky’s acquaintances, who are involved in the meth manufacturing and distributing business. Did Vicky simply slip on black ice while taking a drug-addled walk at 3 a.m., or did someone have a motive to kill her? While her mind is thus engaged, Alma’s heart is pulled back into the past by her family and their ancestral ranch an hour out of Billings: “the home place.” Her grandmother Maddie is still the loving and feisty white-haired matriarch, but age has caught up with her. Walt, a grumbling grizzly of a man, hides in his garage workshop and has little to say to Alma, his wife Helen (in a wheelchair due to worsening multiple sclerosis), or anyone else. Pete, with whom Alma has a good rapport, owns a high-end coffee shop with his partner Shep. Eleven-year-old Brittany had been living an unsettled life with Vicky and is now in need of a guardian. Matters are complicated further by a predatory coal mining company “land man” who is trying to get neighboring ranchers to sell their property. And Alma is surprised to find her high school boyfriend is also back in Montana running the family ranch after finishing his education at Stanford. La Seur has woven all these strands into a seamless tapestry. The Home Place is a character study of Alma’s belated coming-of-age as she faces her family’s tragic past and complicated present, a mystery that becomes increasingly suspenseful, and a love letter to the Big Sky country of southeastern Montana. The characters are people we care about (or, in the case of the less admirable ones, at least wonder about), the plot is complex and emotionally resonant without sliding into melodrama, and La Seur’s writing is graceful and evocative. In many ways, The Home Place is the type of novel I like best: literary fiction with an ethical dilemma or mystery at its core, well-written and respectful of readers’ intelligence, but warm-hearted and well-paced. In that sense, it reminds me a great deal of one of my favorite books of last year, M.L. Stedman’s impressive debut, The Light Between Oceans. La Seur has already made a name for herself with this sure-handed and cinematic story. She spent nearly a decade writing it while working as an attorney in Billings, and the time and effort shows on every page. Highly recommended!